Sooo it's been a while since my last post and BAM! I'm 33 weeks pregnant. 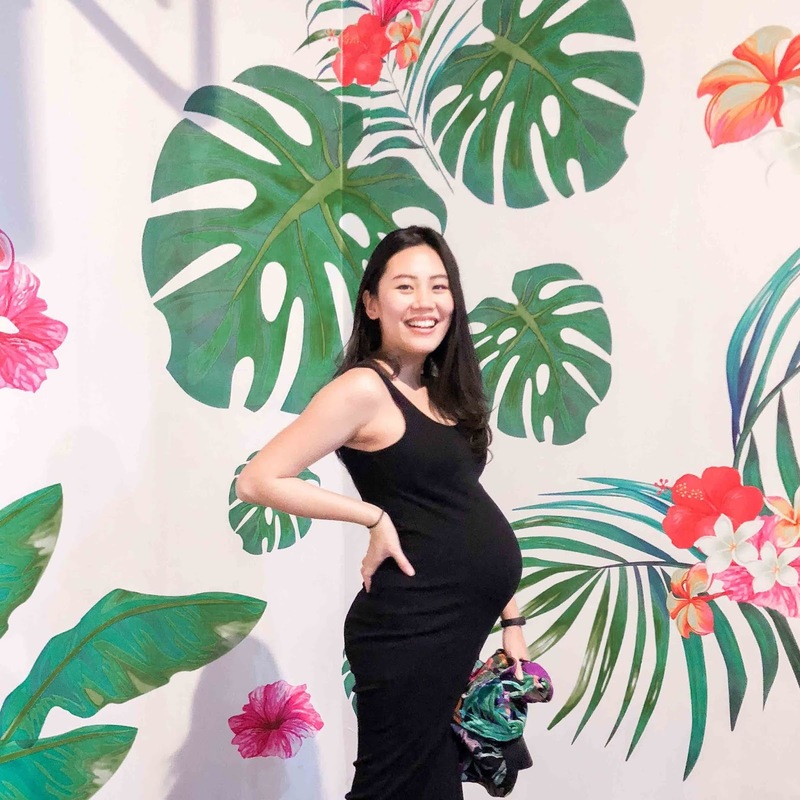 As a first time mom, there are so many things I did not know but thanks to this internet era I've been able to read up a whole lot of information about pregnancy, delivery and motherhood. Now we're weeks away from the due date, and we cannot wait! If you didn't know already, we're having a boy (YAY!). 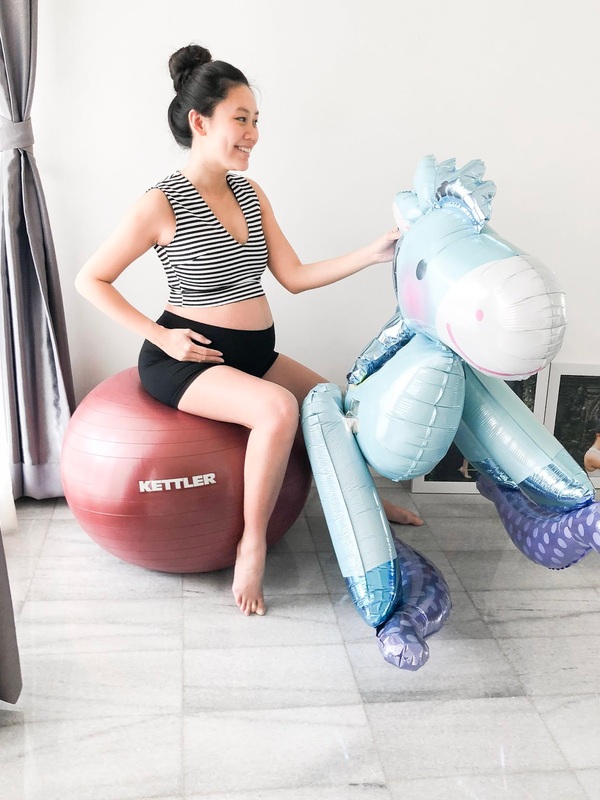 I thought having gone this far on this pregnancy I should share with you my take on several pregnancy-related stuffs that we bought and whether we actually used them or not. Hopefully some of you who are also expecting or trying or thinking about having a baby sometime in the (near) future may find it useful, as I did many articles written by or blogs made by other mothers on various issues surrounding pregnancy. Let's begin! I bought Mustela stretch mark prevention cream in my first trimester, when I hadn’t gained much pregnancy weight and my belly were not that big. I’ve been using it more regularly as the belly grew bigger week after week. Now I’m 33 weeks pregnant and so far has not developed a stretch mark. Some articles on the internet suggest that preggers don’t actually have to use stretch mark cream, as the point is to keep your skin moisturized and so any kind of lotion or moisturizing technique would equally prevent stretch mark. I have not tested this claim, and maybe won’t for the rest of this pregnancy (only a couple weeks to go!). Mustela stretch mark lotion has been a part of my daily routine and it is not burdensome at all. Plus, I love the scent! No thanks to scoliosis, I felt pain on the back side of my hips area everytime I sat down, stood up, or walked for too long. So without further ado I bought the first hip support belt I spotted in one of the biggest pregnancy and motherhood stores at the mall. That time I was 2 months pregnant. When I came home I read the guide and instruction on the side of the box (something I should’ve done BEFORE I bought the thing) and learned that it was only recommended for use starting month 5 and up. My guess is because before the second semester, the uterus and fetus is still down low by the pelvis, and so the hip support belt might apply unnecessary pressure on that area? Whatever it was, I stored the belt in my wardrobe and told myself I’d use it when I entered month 6. Now in month 8, I’ve developed more back pain on the middle back all the way down to the hips. Some friends suggested that the support belt might help because it supports the belly and thereby relieves tension from the back. I, however, am still not using it and don’t think I’m gonna. Main reason is because my back pain is most intense when I sit down (as opposed to when I walk or stand up), so I don’t think the belt would help. I’d probably put it up for sale or rent, maybe other preggers could benefit from it more than I do. Plus, before pregnancy I always slept on my back, which is not a recommended position for preggers especially as the belly grows bigger. We are told to sleep on our left side (which is the most optimum position but hurts my back like hell) or right side (which does not hurt me but, well, is not the most optimum position). I tried, but I always found myself laying on my back again when I woke up. 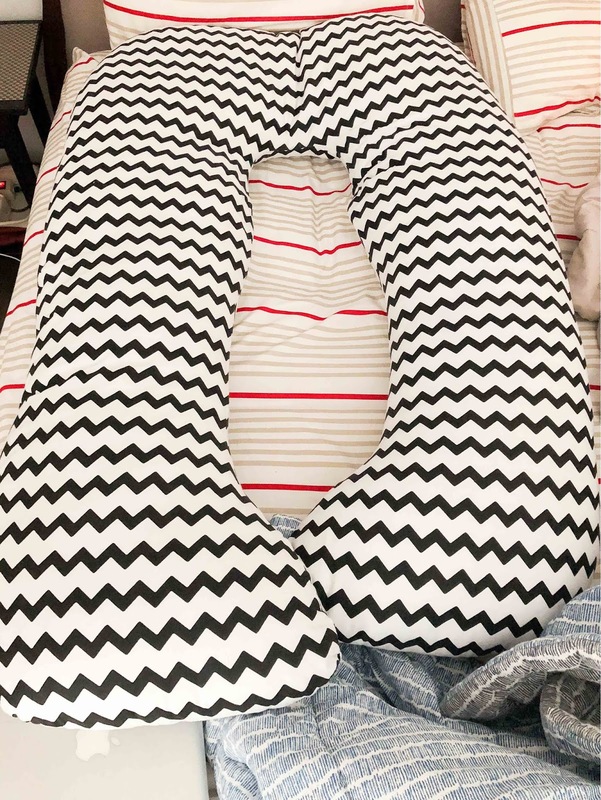 This pillow helps support my back so when my body sneakily tries to shift to on-the-back position, it just fell on the pillow, so I end up in a diagonal leaning position. In one of my yoga classes the instructor advised that we get a gym ball, because we can use it for pelvic exercises to prepare for labor. I thought it was a fun motivational tool to get the lazy bum that I am to exercise so I bought it. They come in different sizes depending on your height. I’m 163cm tall and I got the one with 65cm diameter. It’s so far been useful because it makes pelvic exercises real light and fun. I can sit on it and exercise while doing some work on my phone or watching TV after work (sitting on the couch has been more and more uncomfortable anyway). Plus, when you’ve reached full term, one way to induce labor is by bouncing on the ball. How fun is that?! My OB gave me some multi-vitamins to take daily, but I also drink pregnancy milk every night. I started with Prenagen Mommy Emesis since early pregnancy. Recently, around 3 weeks ago, I changed to Prenagen Mommy (no Emesis). The reason was because the sales girl told us that Emesis is designed to alleviate morning sickness, which I never had, so it was more appropriate for me to consume the regular one. Without researching it more we accepted her recommendation, because we thought they’re both Prenagen, what harm could it do us anyway? So now I take the regular Prenagen Mommy every night. Flavor-wise, I always went for the chocolate flavor. Both types tasted similarly but definitely not the same. I do not enjoy the chocolate taste in the regular one as much as I did the Emesis one, to be honest, but it’s still acceptable. 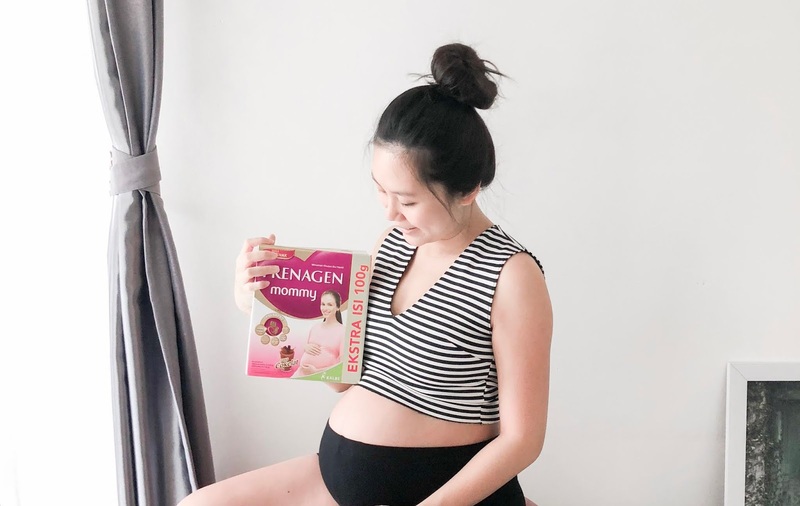 If you have questions for me on my thoughts on other pregnancy-related products, feel free to drop me a message in the comment box or by email, or find me on Instagram at @wynneprasetyo ! thanks for sharing Wynne! hope everything goes well for both of you and your baby until D-day (and after too ofcourse)! Thank you for your sharing.Let me see how difficult it is to be a mother.